2015 was by far the most productive year in AE911Truth's nine-year existence. 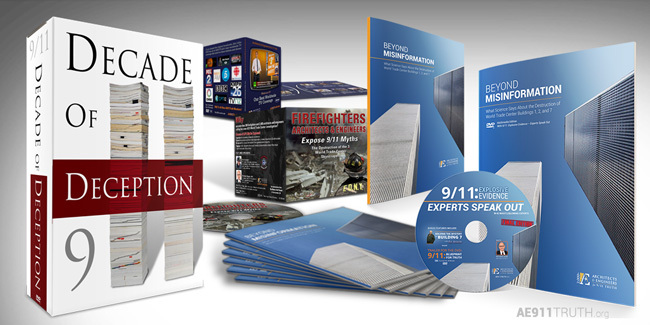 We released two brand-new educational resources: Beyond Misinformation and Firefighters Architects and Engineers: Expose 9/11 Myths. We launched the first unbiased, transparent computer modeling of WTC 7 at the University of Alaska Fairbanks. We made unprecedented inroads to the A/E communities with our AIA resolution, trips to ABX and the 2015 Engineering Summit, and mailing Beyond Misinformation to 20,000 architects and engineers. We also greatly expanded our online audience, with 60,000 new Facebook likes and millions of video views. This was all made possible by you, one of our loyal sustaining members. 2016 can be even more productive, but first we need you to renew your membership donations — which unfortunately stopped processing during the last twelve months (most likely, this was because your credit card expired). 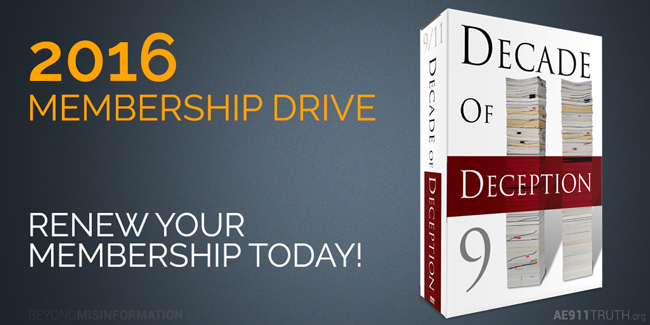 With our Annual Membership Drive underway, now is the perfect time to renew your membership. It’s the one month of the year when we pause to ask every person who believes in our mission to join in and make our work possible. Will you renew your membership today? A great reason to renew right now is the array of DVDs and written materials you’ll receive in return, which you can use to educate co-workers, friends, and family. Our highlight this year is the ultra-popular 9/11: Decade of Deception, a newly-released, two-hour documentary of the 9/11 Toronto Hearings. We offer these gifts not only so you’ll have the tools to spread the truth — but also as a token of our deep appreciation. Simply put, your membership is everything to us. We hope you’ll continue to support our vigorous efforts until we reach that all-important breakthrough — together!